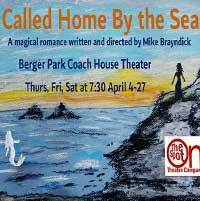 Called Home By the Sea is a world premiere drama set in the 1950's that combines realism with a hint of magic. This story of a young girl and her war-widow mother explores themes of love, loss, growing up, and beginning again. When twelve-year-old Annie gets into mischief in the East End of London, her mother, Molly, takes a job as cook in the Cornish town of St. Just-in-Penwith. Annie is at first not thrilled with her new home, nor with the innkeeper, Ben Treleyn, who seems rather taken with her mother. Then, she befriends Nora Grenlow, a reclusive old woman who lives in a stone cottage on the cliff edge by the sea. What secret is Nora keeping about her past marriage to the late Captain Grenlow? Is Nora really a mermaid, or is that just an idea from a child's dreams? And, when it comes to love, does the heart always know where it best belongs?